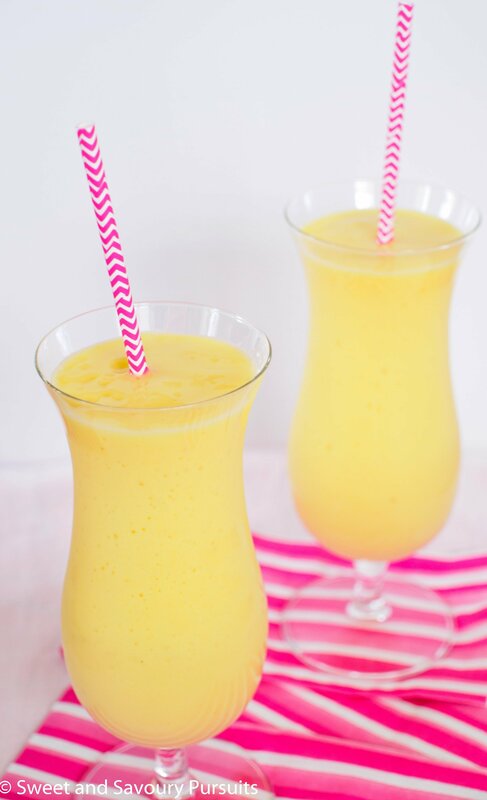 This sunshine in a glass Pineapple, Mango and Orange Smoothie is refreshing, filling, loaded with vitamins and can be ready in less than 5 minutes. We’re having yet another cloudy and rainy day here, and I’m really in the need of some serious sunshine. I decided the best way to get it would be to create it in a drink. So after looking in the freezer and finding some frozen pineapple and mango chunks, I decided to make a Pineapple, Mango and Orange Juice Smoothie. So delicious and refreshing! This smoothie is healthy, filling, and provides you with a good dose of vitamins. Smoothies are a great way to make use of seasonal fruit and veggies. You can use fresh or frozen fruit, just open your refrigerator or freezer and take a look at what you have. You can create so many different variations depending on what you have on hand. I actually prefer the texture of smoothies when I use frozen fruit. It makes it so thick and creamy, it feels like you are having a frozen treat! So next time you chop up a fresh pineapple, remember to put some away in the freezer, you’ll be glad you did when you search your freezer for your next smoothie ingredients. Enjoy! In a blender, add pineapple, mango, yogurt, orange juice and 1 cup of ice cubes. Blend on high until all ingredients are well blended. It really is refreshing, and so good for you. Thanks! Beautiful and soothing drink ! So refreshing and nutritious – a great treat to bring to Fiesta Fridays! Delicious. This is why I need a suitable blender. Oh, and 17C is warm! It hasn’t even been anywhere near that over here yet. Apart from today I’ve been wearing Winter clothing. I do have a beach just down the street though! Thanks. Well, let’s keep our fingers crossed that it only gets warmer. I hope you’ll be able to enjoy the beach soon enough! Thanks for visiting and leaving a comment. Thanks. I know the winter was definitely too long and cold! Oh, my goodness, I think the warmest it’s been so far here in the National Capital Area of Canada was 17C. Yes, please send me some of your sunshine!! !